Madison Children’s Museum connects children with their families, their communities, and the world beyond through discovery learning and creative play. Madison Public Library's tradition of promoting education, literacy and community involvement has enriched the City of Madison for more than 135 years. Safe Harbor seeks to reduce the trauma to children who are victims of abuse or neglect or witnesses to crimes, by promoting the coordination of multi-disciplinary investigations, conducting forensic interviews in a child-friendly environment, and providing ongoing advocacy to affected children and families. The YWCA Madison envisions a community where people of all racial, ethnic, socio-economic and gender groups are valued and included, and discrimination and injustice are eliminated. To this end, the YWCA Madison provides leadership in their community to create social change for all racial, ethnic, gender and economic groups. Through YWCA programming and collaborative initiatives, individuals, families and the community at large are empowered to greatly improve quality of life. Community Shares addresses social, economic, and environmental problems through grassroots activities, advocacy, research, and public education. Boys & Girls Club of Dane County inspires and empowers all young people, especially those who need us the most to reach their full potential as productive, responsible, and caring adults. 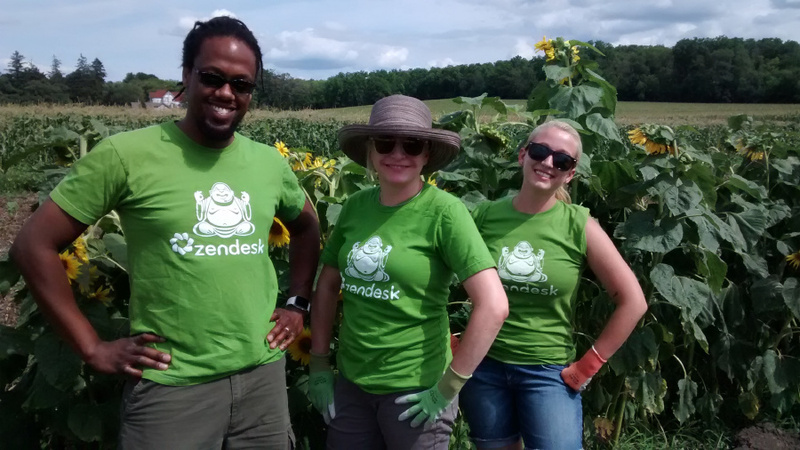 Zendesk volunteers harvesting over 800 lbs of red potatoes with Madison Area Food Pantry Gardens that will get donated to a local food pantry to help supplement the normal allotments with fresh produce.